If you can't understand all those nutritional labels at the supermarket, you're not alone. A medical watchdog group is calling for a new, standardized system it says would help us all make better-informed choices. Registered dietician Samantha Heller said the changes being proposed by the Institute of Medicine are akin to the Energy Star ratings for appliances. 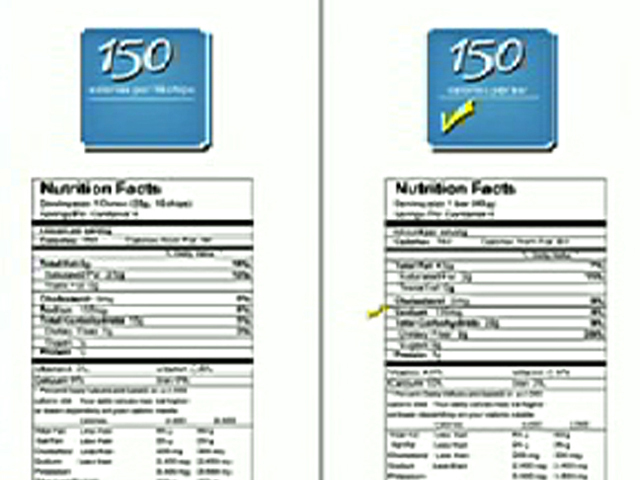 The front of the package would feature a check mark or star markings and the calorie count. The back of the package would have the traditional nutrition facts table. Currently, Heller explained, consumers get mixed messages when it comes to labeling. She said, "A package can say 'high in fiber,' 'a good sourse of calcium' and be high in saturated fat or sodium. Consumers aren't sure what they are getting, and it's very frustrating. ... (The Institute of Health's lables) are looking at calories and then evaluating saturated and trans fat, sodium, and added sugars. If you meet their criteria, you get a check mark for each, or a star. They are still working on this. It's a work in progress, it's an enormous undertaking, and food and nutrition is very complicated." She added, "We need a simple way to choose healthier foods in the store and make it easier for consumers. I teach a whole one-hour class on how to read a food label. They're confusing, and it does makes your head spin. It's an easy way, front of the package, consumer can look at it and, boom, they can make their choice." However, Heller adds, there are some inherent issues with these classifications. "All foods are very different, and what might happen is some foods will be left out and not get check marks that should and vice versa. ... For example, diet soda could easily qualify for three checks, but so does broccoli, and I don't see them as equivalent and, by the same token, vice-versa: Things like nuts and olive oil may not get any checks, when we know they are healthy for you." As for the food industry, Heller says it's fighting back with Food Up Front, a voluntary initiative aligned with Food and Drug Administration (FDA) and Department of Agriculture (USDA) guidelines and regulations. However, Heller says, the labeling uses a number of classifications and numbers, which itself could confuse consumers. She adds, "No food company wants to get no checks and say, 'Don't buy me, I'm not healthy food.' I think it's going to take time and it's going to be a process for the food manufacturers and the Institute of Medicine to work together to create these labels that are fair to everybody. The Institute of Medicine is trying to take everything into consideration."